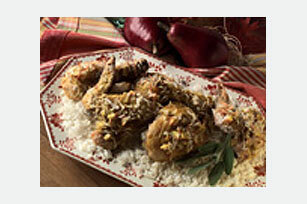 Enjoy this Baked Curry Chicken recipe! Bake chicken pieces in a sauce flavored with onion, curry powder, garlic, coconut and apple for a delicious entrée. Preheat oven to 450°F. Mix 1/4 cup flour, the salt and pepper in medium bowl. Add chicken, one piece at a time; turn to evenly coat both sides. Place, skin-sides up, in single layer in shallow baking pan. Dot with 1 Tbsp. of the butter. Bake 15 to 20 min. or until chicken begins to brown. Meanwhile, melt the remaining 1 Tbsp. butter in medium saucepan on medium-high heat. Add apples, onions, 1/4 cup of the coconut, the garlic and curry powder. Cook and stir until onions are tender but not browned. Stir in 1 Tbsp. flour and the chicken broth; bring to boil. Remove from heat. Reduce oven temperature to 350°F. Pour sauce over chicken; sprinkle with the remaining 1/2 cup coconut. Bake 20 to 25 min. or until chicken is cooked through (180°F). Spoon rice onto serving platter; top with the chicken and sauce. Serve with a mixed green salad for added color and texture.